Do I post too much pizza here? Is there such a thing as too much pizza? I don't think there is. This pizza is a thing of beauty. Allow me to break it down for you: Chewy, perfect pizza dough. Sweet caramelized onions. Carb-o-licious roasted potatoes. Salty bacon. Mozzarella and gruyere. Are you drooling yet? I know that potatoes on pizza seem kind of odd and maybe a tad redundant (carbs + carbs? ), but they provide a nice earthy flavor and wonderful added texture to the pizza. They are briefly roasted, just to cook them through, and then once they are added to the pizza, they get beautifully browned and crispy. The old adage of "Bacon makes everything better" is certainly true here as well. I typically let the seasons guide me in my pizza-making, using as much fresh and seasonal produce as I can. That sadly doesn't work as well in the winter, but this is a great option if you are like-minded about that sort of thing. It's definitely a hearty and indulgent pizza, but when served alongside a leafy green salad with beets and oranges, it is a lovely and seasonally appropriate meal. We're hunkered down in the cold along with the rest of the country, and as if you needed another reason to make a pizza - having your oven on for this will really warm up your kitchen for you! Preheat the oven to 400˚ F, and place your pizza stone in the oven. Line a baking sheet with parchment paper or foil. In a bowl, combine the sliced potatoes with 1 tablespoon of the olive oil and season with coarsely ground salt and pepper. Arrange in a single layer on the prepared baking sheet. Bake, flipping the slices over once, until the potatoes are just beginning to brown, about 10-15 minutes. Remove from the oven and let cool. Meanwhile, make the caramelized onions. Heat the remaining tablespoon of olive oil in a 12-inch skillet over medium heat. Add the sliced onions to the pan, and stir in the sugar, salt, and pepper. Reduce the heat to medium-low. Cook the onions, stirring occasionally, until golden brown and fully caramelized, about 15-20 minutes. Remove from heat and set aside. To make the pizza, increase the temperature to 500˚ F, and preheat it for at least 30 minutes. Roll and stretch out the the pizza dough into a 12-14 inch round on a piece of parchment paper that's been sprinkled with cornmeal. Brush the perimeter of the dough with olive oil, and then sprinkle about two thirds of the shredded cheeses over the dough. 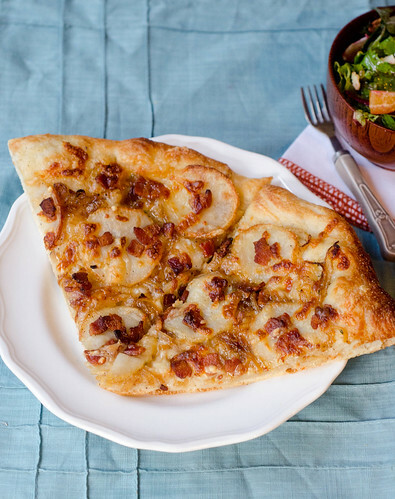 Top with the caramelized onions, potato slices, and crumbled bacon, arranging them as evenly as you can over the cheeses. Sprinkle with the remaining shredded cheese. Transfer the pizza to the preheated pizza stone, and bake until the cheese is melted and bubbling and the crust is lightly browned, about 10-12 minutes. Remove from the oven and allow to cool slightly before slicing and serving. I've done potatoes on pizza before and it really is super. Adds a little something that's kind of indescribable but kind of amazing. Pizza, I really enjoyed it with the flavors and the perfect combo. Oh, how tasty new look, new look after all my stomach can not tolerate it. Pizza, I really enjoyed it with the flavors and the perfect combo. Henry and Tucker are Uno: Let's Fiesta!